A story is unnecessary imo and wouldn't make me any more into OS than I already am. It would make OS like any other AE game; just because it isn't like other AE games doesn't mean it's a failure. It also leaves characters open to interpretation and puts an emphasis on the players themselves and their interactions with other players being the story. I know that there are people who just like the gameplay, but I really need a reason to fight, i.e. plot. They could also introduce minigames and things in quests, so there would be more to do than just battling. Gameplay brings me to a game, but (a good) plot keeps me there. OMG someone else that knows about Entropy, they were really amazing when they were introduced and I would love to see them in OS especially since Nulgath is the one who designed them. I remember when I made an Entropy Fan Art for a drawing contest but it didn't won because it wasn't "player-friendly" due to the blood shown in its sword .-. I would love to possess Entropy in OS, should be fun to see its animations and 5 hit combo. @DeathGuard: I really like it! It's a shame it didn't win! Also, while I meant a chaos character in a similar style to Entropy, I admit I'd love to possess Entropy in OS, too. Also, I made a new Mother Nature character today. Hope you all like it! Entropy Dragons ain't so bad either. Like the helmets. How about a mystery box character with ??? amount of health? Has a very low encounter rate if you do capture it instead of getting it you get a sgs. So yeah, I've finally added some new stuff to my gallery. Both were attempts at trying ou animating something in flash. I did the art itself in sai because of how comfortable I am with it and just transported the files to flash. They may look a bit off in motion, I guess that's because they're rasters instead of vectors. Oh well, was worth a shot. I made a new backstory that I'm saving for the next suggestion contest, but I need some opinions. I'll put a link here for you all. I hope you all enjoy it! You ought to read the original Dracula novel man. Doesn't seem to say much about Morgana though, just her near execution and escape. Currently trying to draw something using flash itself instead of just sai. It's a lot harder than I'm used to but here's a progress shot of something. Imma finish all the base parts first before applying shading so I know how the light and shade should look. @ChaosRipjaw: Why thank you! It also happens to be the longest backstory I ever made XD. And yes, Bloody keeps a diary, though he'd prefer to call it a journal. Also, I was trying to take my sister's advice and, "Show don't tell". I thought also that telling about her during that crucial moment would make it more memorable. Oh, and I just might take you up on reading Dracula. @Blackshock: That's looking really good! I especially love how you added the dragon amulet on the chest! Thanks. Always wanted to sneak in a little homage. Anyway, here's the final product, Could have been better but I guess it's alright considering my current skill level. @Blackshock: It looks really good! Makes you look a lot more skilled at flash than you say you are! Also, do you think that you could give my you're opinion on the backstory of The Heartless One that I posted on this page, as well as my drawing of Mother Nature? I feel like they need to make playable characters a little easier to possess. Whenever I go on to Oversoul, I want to possess the new characters that they have recently added but I find it difficult to possess any character worth having because they are either hard to find, hard to possess, cost soul gems, or a mixture of the above. Of course, since I am a free player, I will have a harder time but it still feels ridiculously difficult to posses anything. Anyone else feel this way? I don't have much of a problem possessing any characters. Very nice sketch. I like it. The designs on the. .. kilt (?) are very interesting. Along with the general idea. 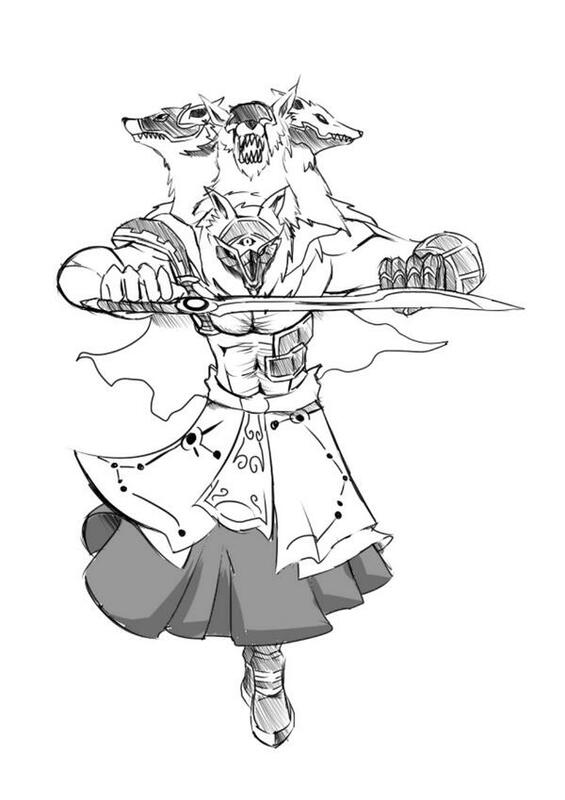 A mystical, four-headed lycan wielding a sword? . . .
Oh, Sirius eh? You serious!? Lel. Ok. Well either way, very interesting. Hm. . . . I made a new backstory and art today for my sister's personal character, Jade, and I was wondering if I could get some opinions on it! Cool design for a character, but I'm not sure how much experience you have playing Oversoul since you added 7 life drains. Life Drain costs 8 energy and the energy cap is 20; 7 would be 56 energy. You also have 11 DoTs, each of which costs 6 energy, so that's 66 energy. The idea is interesting, but the deck would not work at all since you would have to spend most of your time charging instead of using your cards. It would be very interesting play feature if monsters with dual elements existed (fire and water, dark and fire, etc.) Any thoughts? Fight the Archfiend. For the Light!